The city of Cancun gets all the international press about fun and sun on the Yucatan Penninsula. There you can find night night and beach life worthy of any tropical destination in the world. Just 30 kilometers south of Cancun, the sleepy village of Puerto Morelos is more to the liking of visitors who prefer to sink into a place, absorb its sights and sounds, and get to to meet local who make the place the perfect prurient of Mexican hospitality. The area was inhabited and dominated by Mayan civilization until most of the local sties were abandoned by the 15th century. Puerto Morelos modern history begin in 1898, when the Yucatan Company was founded to exploit and farm the agricultural and forest products from the surrounding jungles. The port of Puerto Morelos was built to ship these products and a pier was built for fishermen. Today Pelicanos Resturant stands in that very spot. 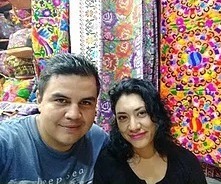 Maria Gomez, owner of El Mexicano gift shop said, "I could not imagine living in Cancun with all that traffic and noise,. Here visitors get to see a glimpse of a real Mexican beach town." Although still a fishing village, the government declared the reef area and mangroves an ecological preserve with the intent to locals to keep development to a minimum. The Mangroves are extensive and the water is crystal clear. The village flea market is small but with the original feeling of real artisans enjoying their original often. Often there is music or a snow played in the plaza and some local food to try. At the beach, PoMo (Yes it is OK to call it that) has a defining landmark, a leaning lighthouse that makes the leaning Tower of Pisa look downright upright. After Hurricane Beulah tried to topple the beacon in 1967, residents built a new lighthouse but refused to take down the old one. Abraham Gomez, manager of Caribe Suites Condos along with his wife Maria (Above), laughs when he talks about the lighthouse, "The government wanted to take down the lighthouse but the people insisted it stay. No one knew then it would become such a symbol." As you walk the wide white sand beaches, watch the fishing boats come and go or take a dip in the bright blue waters of the Caribbean, you may want to remember the lighthouse as pointing a way to a different way of life. One of quiet, and beauty and calm that beckons back every one who visits Puerto Morelos.